Your Puppy Golightly will fit in perfectly in the big apple in the Barkfest at Sniffany's Dog Costume from California Costumes! 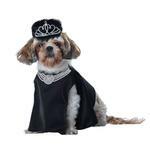 Bring out the film star in your little one with the Barkfest at Sniffany's Dog Costume! Your pup is sure to be the center of attention wearing this stunning Halloween Costume. These adorable costumes are great for Halloween parties, trick-or-treating or just a fun photo op! Barkfest at Sniffany's Dog Costume Customer Photos - Send us your photo! On Halloween evening, I attended a lavish paw-tay at Barkfest at Sniffany's. I was dressed in this glamorous costume recommended to me by my great friend and fashion mentor, Audrey Hep-Paws! I looked and felt fabulous, and my sweetheart Pomeranian, Junior, and I danced the night away! At six years old, it was my first Halloween gala, and my elegant and unique BB outfit made me feel as frisky as a puppy and ready to growl! Thank you, Baxter Boo, for providing the perfect costume for a perfect evening! Posted On 11/02/17 by Susan & Bella M from Cranston, RI Yes, Susan & Bella M recommends this product! Our six year old cairn terrier chihuahua mix, Bella, attended a lavish Halloween paw-tay dressed in this gorgeous costume recommended to her by her great friend and fashion mentor, Audrey Hep-Paws. Bella looked and felt fabulous in this unique and elegant outfit, and she was beautiful and frisky and ready to growl! Bella and her Pomeranian sweetheart, Junior, danced the night away! Thank you Baxter Boo for helping Bella be the outstanding "belle" of the ball!